Ahoy there internet! Like most checklists this is a work in progress, but I will attempt to keep track of all the exclusives being offered at San Diego Comic Con this year so it will be easy for you to decide how you want to spend your money! Check back often as we will be updating as companies release additional information. Comic-Con 2012 Exclusive! War hero. Brilliant strategist. Respected leader. We’ve captured the essence of the steely Admiral Adama in this 1:10-scale maquette measuring 5.9 inches tall. This hand-cast, hand-painted polystone statue shows the battle-weary Adama evincing strength and resolve in a moment of reflection, as he ponders his next step in humanity’s struggle for survival against the Cylons. Adama stands on a circular base displaying Galactica’s phoenix emblem and is posed in a screen-accurate uniform. 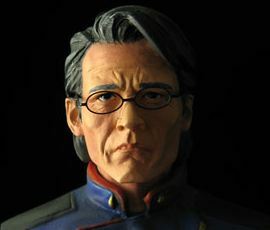 Available in an edition of just 1,000 statues, each Admiral Adama Animated Maquette is individually numbered on the bottom of the base and also includes a numbered certificate of authenticity. Comic-Con 2012 Exclusive! The man known as Shepherd Derrial Book has one heck of a backstory. We know that the gentle Christian preacher in Firefly and Serenity has stolen another man’s identity. But what about Book’s VIP status with the ruling Alliance and his familiarity with space travel, firearms and hand-to-hand combat? He’s a mystery to the crew he travels with on the Firefly-class transport, Serenity. QMx has captured the two contradicting sides of Derrial Book in this 4.5-inch, hand-cast, hand-painted maquette. The wry Shepherd holds a Bible in one hand and a shotgun behind his back — fully prepared for what might lie ahead. Our Little Damn Heroes® Shepherd Book Maquette comes with a sleek black stand and is offered in a numbered, limited edition of 1,000 statues and comes with a certificate of authenticity. The hottest comics crossover of the summer is now the coolest con-exclusive Minimate 4-pack! Hope Summers may be humanity’s destroyer or mutantkind’s savior, but whichever it is, three of the most powerful mutants in the X-Men army have united to protect her from Captain America and the Avengers. Hope’s first-ever Minimate 2-inch minifigure is joined by three brand-new Minimates of Cyclops, Emma Frost, and Colossus in his new Juggernaut-inspired look. Available from Diamond Comic Distributors (Booth #2401) and Diamond Select Toys (#2607). Diamond Select Toys’ bust of Spider-Man from the new Amazing Spider-Man movie just got even more amazing! This SDCC-exclusive version sports a metallic paint scheme, stands almost 10 inches tall and is limited to only 600 pieces! Available from Diamond Comic Distributors (Booth #2401) and Diamond Select Toys (#2607). In this summer’s blockbuster movie, the Amazing Spider-Man and the ferocious Lizard did battle under the streets of New York City, and Diamond Select Toys is adding to their popular movie assortment with two new Minimates! Tiny two-inch minifigures of Spidey and the Lizard get a splash of sewage in this exclusive two-pack. Available from Diamond Comic Distributors (Booth #2401) and Diamond Select Toys (#2607). The first series of Battle Beasts Minimates won’t be out until this fall, but Diamond Select Toys is offering fans a preview set that’s only at SDCC! The fully painted two-pack of 2-inch Beasts includes the heroic ram Vorin, star of the IDW comic series, and an all-new villainous dragonfly character, Zik! Available from Diamond Comic Distributors (Booth #2401) and Diamond Select Toys (#2607). From Diamond Select Toys’ popular line of Star Wars banks comes a new, exclusive droid! Only available at SDCC, this 10-inch vinyl bank of R2-R9 from “Episode I: The Phantom Menace” has a slot in the back for storing your loose change, not to mention your secret battle plans. Best of all, this 1/4 scale figure fits in perfectly with your Ultimate Quarter Scale action figure collection! Available from Diamond Comic Distributors (Booth #2401) and Diamond Select Toys (#2607). The first two Walking Dead Minimates from Diamond Select Toys are only at SDCC! This two-pack of 2-inch minifigures includes a “battle-damaged” version of Officer Rick Grimes and a casual-attire zombie! Available from Diamond Comic Distributors (Booth #2401) and Diamond Select Toys (#2607). This sneak-peek version of Diamond Select Toys’ upcoming Femme Fatales statue is a dream come true! Featuring comic book heroine Darkchylde in stunning white, this 11-inch-tall statue is based on artwork by creator Randy Queen, and limited to only 100 pieces. Available only at the Diamond Select Toys booth (#2607)! ?The first issue of IDW’s new Battle Beasts comic book mini-series is here, and SDCC will have its very own cover! Depicting heroic beasts Vorin, Merk and Gruntos about to do battle on the steps of the San Diego Convention Center, this souvenir edition will be available from Diamond Comic Distributors (Booth #2401) and Diamond Select Toys (#2607), as well as numerous retailers on the show floor. Both figures can be bought online if you will not be at the show, they will also be at the Square Enix booth as SDCC. You can preorder Koto’s items if you will not be attending SDCC here. Limited quantities available. Mezco items can be purchased at their online store. Street Fighter 25th Anniversary Chess Set – $400 each, 10 units at 2 per day. Individually Numbered all below #15. First come first served. Hello Kitty Chun Li Plush – $ 40 each, Extremely limited units per day. Shared exclusive with Toynami. Pink Chun Li Bobble Budd – $11 each, 1000 units at 200 per day. Monster Hunter blind box poogies Japanese import– $10 each, 89 units. 2 per person first come first served. Welcome To Raccoon City metal sign (with actual bullet holes) – $25 each, 20 per day. One per person. Hot Toys exclusives will also be available to order on Sideshowtoy.com.